Do you like tacos? How about croissants? Well you’re in luck, because San Francisco’s latest food trend has arrived at the Ferry Building! Introducing the Tacro, Vive La Tarte’s new hybrid creation. 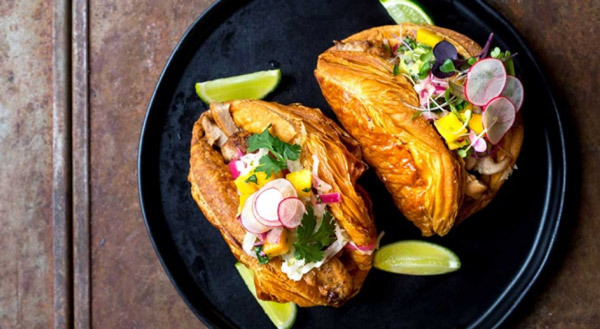 Featuring a flaky croissant shell, the Tacro is stuffed with savory fillings including chicken and avocado, pineapple with barbecued jackfruit, and slow-roasted pulled pork. Created by Belgian couple Julie Vandermeersch and Arnaud Goethals who co-founded Vive La Tarte in 2011 as a pop-up bakery in the back of their orange Volkswagen van, the Tacro is sure to catch the eyes of foodies everywhere. The founders quickly garnered a following, leading to the opening of their brick-and-mortar shop in South of Market just three years ago, and their latest store opening in the Ferry Building.